JERUSALEM (CNS) — Anytime there was singing, Palestinian Adan Othman-Cabat and Israeli Niri Boasson were the first to join in. “She has an amazing voice. The first time I heard it I was blown away,” Othman-Cabat, 18, said of her new Jewish friend. “She is so passionate about singing,” Boasson, 16, said of Othman-Cabat, who was raised in a Muslim family but identifies as an atheist. Both Jerusalem high school students were taking part in the first Scholas Youth Summit for Peace in Jerusalem. The July 2-5 summit was held in collaboration with the Harry S. Truman Research Institute for the Advancement of Peace of the Hebrew University. Religious and academic leaders participated in a parallel scholarly summit. Archbishop Giuseppe Lazzarotto, apostolic nuncio to Israel, was one of the three religious leaders of the Abrahamic faiths who opened the event. Scholas Occurrentes is an international educational organization created by Pope Francis when he was archbishop of Buenos Aires, Argentina. Started as a conduit for encounters between public and private schools in Argentina, it was adopted as a global youth project of the Vatican with the aim of educating young people in the commitment for the common good. In February, Pope Francis met with leaders of Scholas and the Hebrew University at the Vatican, supporting the idea of such a summit based on religion as a unifying, rather than a dividing, factor. Pope Francis sent greetings for the final ceremony and an olive tree — a traditional symbol of peace — was planted in his name. Seventy-five youths, ages 15-18, from Mexico, Argentina, Brazil, Congo, Kenya, Mexico, and Spain participated in the youth encounter. They shared their stories and experiences in group discussions and connected through collaborative projects in art, music, dance and poetry, which they presented at the closing ceremony. 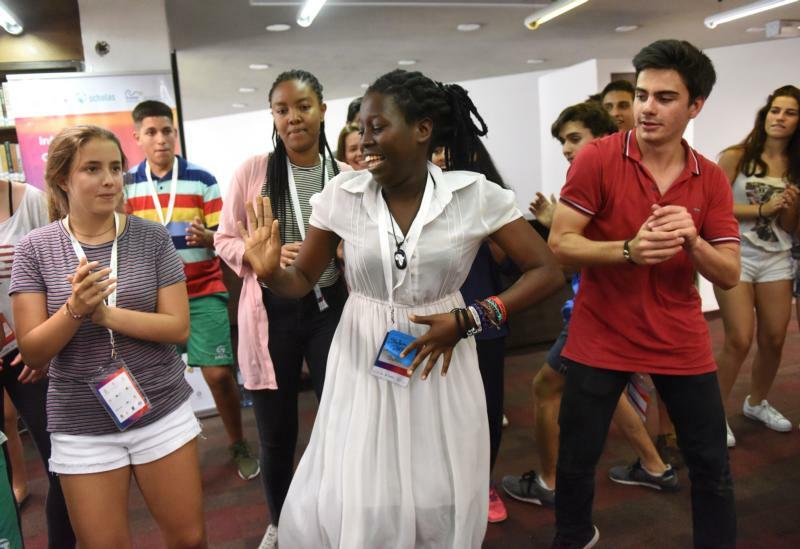 Ignacio Rodriguez, 15, of Madrid said when he was working with the other teens, he realized most of them liked the same things. “We’re all singing, dancing without judging one another. We really are all the same,” he said. Rodriguez said he had learned how to value the freedom from fear he has in Spain by listening to the experiences of others, like the teen from the Congo who recounted how he had almost been hit by a bullet in the fighting there. Silvio Freire, a teacher from the Santa Maria College in Sao Paulo, who accompanied the Brazilian contingent, said though it was important for the young people to learn about one another, the methodology used in the encounters of maintaining and respecting one another’s differences was just as important. “It is very complicated [to create cultures of peace], but this is putting the young people on the right path. Now there needs to be also concrete actions,” he said. Even in this digitized world it is easy to only be exposed to one side of a conflict, said Karisa Erickson, 16, an American who lives in Kenya with her family. She said the youth summit had reminded her that there are different angles to every issue. For Shalom Irakoze of Burundi, the summit was an “unforgettable” experience that helped solidify the idea that, even as a young person, she can work to bring peace into her own community.